"Page From the Past" is a feature that will change from time-to-time, so be sure to come back. Bake ovens were always built as close as possible to the kitchen door. They varied somewhat in size, depending on the size of the family at the time of construction. The outside measurement of an oven was generally 4 x 6 feet or 6 x 6 feet. The height was about 5 feet. The oven proper was about 2 feet off ground, with a strong reinforced floor made of hard well-burned brick. The top of the oven was shaped like a dome, 2 ½ feet, at the top. There were varied types of openings at the back of the oven for the smoke to escape, causing the fire to draw properly. There was a metal door at the front of the oven with a damper so that the fire could be controlled. Beneath the oven floor was a 2-foot opening in the front without a door. This was used to place the hot coals and ashes when they were removed from the oven to hold the heat. If this was not sufficient to keep the heat at an even temperature, more wood was added. Hardwood was used to eliminate odors and also to hold a more even heat. New bake oven at the homestead. A good fire was built in the oven proper and allowed to burn until the entire oven was thoroughly heated. The baker judged the temperature of the oven by placing her hand inside, away from the fire. Experience made her very efficient at judging the temperature. Another method of measuring the temperature was to hold a chicken feather inside and, if it would singe, the oven was ready to bake bread, cake and pies. I have seen my mother apply both of these methods before thermometers were readily available. After the oven was ready, all of the hot coals and ashes would be removed from the floor of the oven and placed in the compartment underneath, and then more wood would be added to hold an even heat. The pans filled with the dough were placed on a wooden paddle, 8 inches wide and 15 inches long, with a 3 or 4-foot handle. This was made from a 1-inch board. The end was sharpened so that it would slide under the pans after the bread was done. This paddle was called a “peel.” Before the era of tin pans, cabbage leaves were used in season. I have eaten half moon pies baked like this. 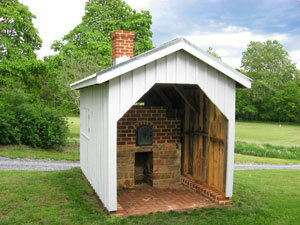 Most well constructed ovens were built with a gable roof, and with a 3-foot projection over the front. This projection gave the person in attendance protection against the weather and gave the oven a longer life. Bake ovens were used exclusively throughout the period when cooking was done in the open fireplace. Many people continued to use them after ten plate stoves and kitchen stoves came into use. The reason was that baking slowly made all baked goods better flavored. Some people continued to use outdoor ovens as late as 1910. For example, pine smoke would ruin the taste of the baked goods.